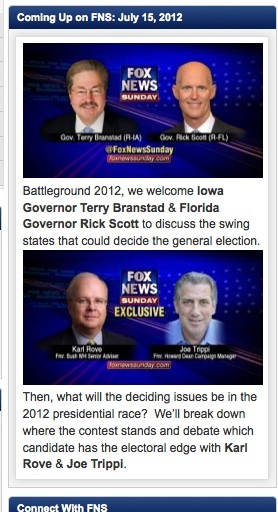 Fox News Sunday discussed entitlement reform and “the swing states that could decide the general election” today with two Republican governors, Terry Branstad of Iowa and Rick Scott of Florida. No Democrats took part. When asked about how to deal with people who don't have health insurance, Scott replied that "The way to fix that" is to put patients in privately-owned managed care organizations (one of which he just may have a financial interest in) "which will help make sure they get to a primary care doctor or get to a specialist... so they don’t end up in an emergency room." Before getting to health care reform, Scott and Branstad attacked the Obama administration for proposing state waivers against work requirements for welfare reform. Host Brit Hume dubiously said the waivers “stirred so much interest at the end of the week.” If so, I must have missed that interest hiding under rumors that Condoleezza Rice might be Mitt Romney’s VP pick and all the talk about his ties to Bain Capital and his tax returns. I’m sure it’s just a coincidence that the subject offered the guests an opportunity to attack Obama as opposed to, say, defending Romney. Scott agreed. He said, “Personal responsibility is very important.” Well, unless you’re the head of a hospital chain that paid the largest-ever Medicare fraud fines. When Scott was ousted as CEO and chairman of the board of Columbia/HCA, two weeks after federal agents raided the company for documents as part of its fraud investigation, he walked away with a benefits package estimated at close to $10 million, as the Sarasota, Florida Herald Tribune reported. Scott says on his website that “mistakes” were made at Columbia/HCA and that he takes “responsibility” for what happened. Otherwise, he’s been evasive on his role in the fraud. He repeatedly tells people to go to his website to get his side of the story, then quickly tries to move on to other subjects. Throughout the campaign, he has dodged debates and media interviews. Not that Hume brought up any of those pesky details. He moved on to the subject of Medicaid expansion and the right of states to opt out. Without the expansion, Mr. Rueben (president of the Florida Hospital Association) and others in the health care industry said, the cost of uncompensated care — emergency treatment for those who are uninsured and cannot afford to pay — will continue to spiral upward and more costs will be shifted to the insured. Jackson Health System, the safety-net hospital system in Miami, provided more than $450 million in uncompensated care last year. The cost of living has increased 67 percent since 1990 while wages have risen only 21 percent, …(P)roductivity has risen without any comparative increase in income for the low or middle classes, (and) the share of American after-tax income has shifted drastically toward top earners since the late ‘70s. And if they get into a car accident, have a child that suddenly develops a high fever or, come down with heat stroke because they can’t afford air conditioning, then what? Hume didn’t ask. Nor did he point out a few inconvenient truths about Scott’s plan: Georgetown University studied the pilot programs already in place in Florida and found, “There is no clear evidence that the pilot programs are saving money, and if they are, whether it is through efficiencies or at the expense of needed care.” Also, as Mother Jones reported last year, Scott, himself, stands to personally benefit from this program, via an urgent-care company called Solantic. Scott founded Solantic not long after he was ousted from Columbia/HCA and turned over his $62 million stake to his wife in January, 2011. Scott’s current proposal aims to save the state $1 billion by drastically overhauling Medicaid, allowing private managed care companies to bid for contracts rather than paying traditional fee-for-services. The majority of Medicaid patients receive care through private companies and HMOs, but under Florida’s bill such firms would end up having vast new authority over the program, with great leeway to limit access to services or reduce benefits. The bill would also put a hard cap on the amount of money that these managed care companies could spend on Medicaid, which advocates say could particularly harm disabled and elderly patients who require costlier long-term care. “Death Panels,” anyone? It seems an obvious question to Scott’s “solution.” But Hume never raised it. Send them straight to the Cemetary by throwing them over the fence,great idea,then we can do away with Emergency rooms and save money. That’s great, what about the people which are disabled and can’t work? Before making commitments think it though unlike the Governor. I had not noticed this before, but doesn’t Teabagger Scottie bear an amazing resemblance to the Grim Reaper? Given his health care policies, it does seem fitting. Putting the poor, disabled and elderly into the hands of for-profit corporations sounds like a great scheme for getting rid of the least productive members of society. Perhaps these managed care facilities can force the poor to work off the fees for their healtcare-and similar to our prison system- Americans can work as slaves for the corporations that control their lives. Was it here that I heard that Repugs would like to reverse the law which forces hospital emergency rooms to accept all patients regardless of their ability to pay? 1. If you are not rich, don’t get sick. 2. If you do get sick, die quickly. The Tea Party right is full of people in the medical profession that are terrified of health care reform because it’s the end of their free ride scamming it. They also have quite a few Canadians that moved their clinics to the US, and during the Obamacare debates were arrested for massive frauds that would have gotten them arrested in a week back home. But by all means, Let’s hear more from them.